Nash: You're not supposed to smoke in here. Brant: What are you going to do, shoot me? A cop killing crim is giving the police the run around in old London town. 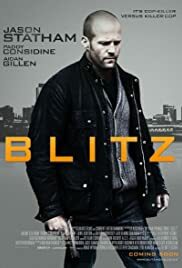 Blitz is a good movie that finally comes to life about 20 to 30 minutes in when we finally get to the main story. Once the chase is on with the odd couple partnership of tough rule breaking Tom Brant (Jason Statham) and gay straight laced Porter Nash (Paddy Considine) pursuing the cop killing criminal who's hungry for notoriety the Blitz (Aiden Gillen) the movie comes into it's stride. Before that we're inundated with so many characters it's a little confusing. What makes matters worse is that none of these side characters stories are ever really finished and the time wasted on them could have been spent giving a little more screen time to Porter Nash who is sadly underused. Don't get me wrong though I enjoyed the film. Aiden Gillen is a brilliant bad guy, giving his character a Johnny Rotten swagger. I felt myself enjoying hating the Blitz and couldn't wait to see him get his just deserts but we could have done with getting a little more insight into his behaviour. Statham does a good job showing a little weakness now and then in his usually gruff demeanour. As I have already said Paddy Considine is great but not in it enough for my liking. London looks great and there is an exciting chase through the streets which is one of the high points of the movie. I enjoyed the movie and would happily watch it again. It's biggest fault was trying to juggle too many story lines at once and unfortunately it dropped a couple of balls. 77 of 104 people found this review helpful. Was this review helpful to you?